Alabama’s auto sector won the grand prize in 2018, a $1.6 billion greenfield plant that led a year of industry expansion announcements. A gleaming 2019 Passport makes its way down the line at Honda Manufacturing of Alabama in Lincoln. Despite sluggish vehicle sales nationally and uncertainty over President Donald Trump’s trade and tariff policies, Alabama’s auto industry continues holding its own as the nation’s fifth-largest vehicle manufacturing state. As parts of the U.S. were rocked in 2018 by General Motors’ planned layoff of 14,000 workers and associated plant closings, Alabama announced or completed several major auto plants and expansions. The grand prize was Mazda Toyota Manufacturing USA, a joint venture that’s building a massive, $1.6 billion facility in Huntsville. Scheduled for completion by 2021, the plant will eventually have the capacity to build 300,000 vehicles a year and employ as many as 4,000 workers. That puts the facility in the same league as other large auto manufacturers in Alabama — Mercedes-Benz, Honda and Hyundai. Expected traffic increases from the Mazda Toyota facility are so large that a portion of Interstate 565 near the plant is being expanded to prevent bottlenecks. Once Mazda Toyota is operational, it appears Alabama will become the nation’s fourth-largest auto producing state. Another key project was begun last October when Mercedes-Benz broke ground on a 2 million-square-foot plant in Bibb County that will supply battery packs for electric SUVs the company will start producing in Vance at the start of the next decade. The Bibb County facility is part of a $1 billion plan Mercedes-Benz has announced to make electric vehicles in Alabama. In Montgomery, Hyundai is spending $388 million to build a new plant for manufacturing engine heads and enhancing existing operations, adding 50 jobs in the process. In Birmingham, Indiana-based Autocar opened a $120 million facility that will employ 746 people when fully operational. Autocar brings a new look to Alabama in that it will build heavy-duty trucks for commercial and municipal use. 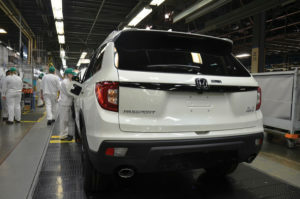 Honda announced last July that it would spend $55 million for an expansion at its plant in Lincoln. The expansion, combined with one announced in 2017, is adding more than 425,000 square feet of space to Honda’s plant at a cost of $150 million. Toyota, meanwhile, began producing a next-generation 4-cylinder engine last year following a $106 million investment that added 50 jobs at the company’s Huntsville plant. All of this is positive news given that Alabama’s vehicle production numbers have slipped since 2016, when the state made a record 1.1 million units. That number fell to slightly less than 1 million in 2017 and is expected to be about the same when 2018 figures are released. Those lower numbers reflect lackluster automotive sales nationally. Vehicle sales in the U.S. peaked in 2016 at 17.5 million vehicles and were forecast to be 16.7 million in 2018. Despite the slowdown, Alabama’s auto industry has fared well, making one of every four passenger vehicles produced in the South. “I see a very positive picture for the automotive industry in Alabama,” says Ron Davis, president of the Alabama Automotive Manufacturers Association. “We have the Mazda Toyota plant coming. Our OEMs are expanding and preparing for the future. Mercedes-Benz and others are positioning for electric vehicles and technologies of the future. Although the large auto manufacturers are the industry’s flagships, most of Alabama’s roughly 40,000 automotive industry jobs exist within an extensive network of more than 200 suppliers. New construction and expansion activity among those companies also has been brisk. A few examples begun or completed last year include Japanese supplier Yorozu’s $110 million facility in Jasper, which company officials say could have 300 employees by 2020. Topre America completed an $80 million expansion in Cullman, with plans to back it with 98 jobs filled early this year. MoellerTech’s new $46 million facility in Bibb County opened with 50 employees and the company hopes to have 220 by the end of 2019. Work has started on a $115 million plant in Huntsville, where Bocar plans to eventually employ 300 people. SMP opened a 700,000-square-foot plant in Tuscaloosa with 320 employees, a number the company hopes will grow to more than 1,000. A few other names landing in the state or expanding existing operations are Unipres in St. Clair County, Eissmann in Pell City, Hwashin in Greenville, Woodbridge in Huntsville and New Flyer in Anniston, a major player in bus transportation. As part of its rise on the national automotive stage, Alabama’s auto industry has grown into America’s third-largest vehicle exporter, trailing only Michigan and South Carolina. Alabama’s light vehicle exports — sedans, SUVs and light trucks — hit their peak value in 2016 at $7.9 billion. That slipped to $7.75 billion in 2017, but the state remains a major export player. In support of the state’s auto manufacturers, the Alabama State Port Authority is teaming with a South American partner to develop a $60 million facility that will allow vehicles to be driven directly onto cargo ships for export. Despite Alabama’s success, there is pervasive uncertainty here and throughout the nation’s auto industry because of President Trump’s trade and tariff policies. Prices for aluminum and steel have increased under Trump, and retaliatory tariffs are already impacting exporters of American-made vehicles, including those made in Alabama. “Just as Gov. Ivey has expressed, we are concerned that import tariffs will damage Alabama’s growing automotive industry and put good jobs in our state at risk,” says Steve Spencer, president of the Economic Development Partnership of Alabama. “Already, companies in the state have been forced to respond to tariffs on steel and aluminum. Charlie Ingram is a freelance contributor to Business Alabama and former editor of our sister publication, Southern Automotive Alliance. He is based in Birmingham.